From the outset, the interview between CNN’s Wolf Blitzer and Donald Trump, went from mild manner interview to battle royal in 5 seconds. Trump immediately attacked Wolf Blitzer after his very biased introduction. During the back and forth free for all Trump took at shot at Blitzer and CNN’s ratings, what little there are these days. Donald Trump did not back down Tuesday from his questioning of President Barack Obama’s birthplace, instead arguing heatedly with CNN’s Wolf Blitzer that “a lot of people do not think it was an authentic certificate,” though he declined to offer names of experts who agree with him. Blitzer presented Trump with newspaper announcements of Obama’s birth from 1961. 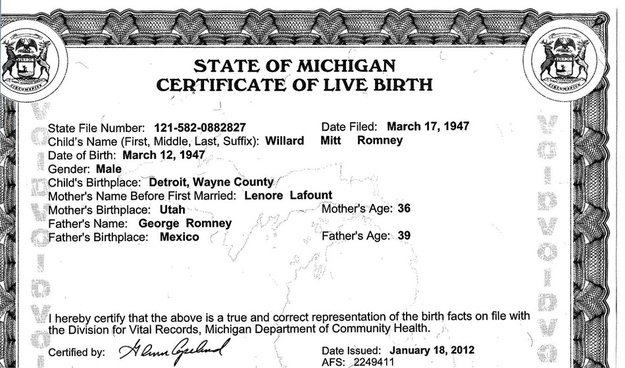 UPDATE I: Just in case anyone was wondering what Mitt Romney’s birth certificate looked like, here it is. What is most interesting regarding Mitt’s birth certificate is that it did not take an act of Congress and a legal battle to get it released. Was Obama born in Hawaii, who knows. However, there is something to be said as to why it was so difficult to get Obama’s birth certificate and his college transcripts. For someone wanting to be President of “We the People” such things should be mandatory not have to be asked for. Are any of the following documents public record? For a guy who promised transparency during the election process, it turns out that he is the least transparent of any candidate. This is a fictional story of his life. The real truth has been hidden away. Is this the type of fictional untrustworthy person that we need as POTUS? No!